Believe you can turn your savings into your dream car with RCBC and RCBC Savings Bank’s (RSB) new Deposit and Drive promo. 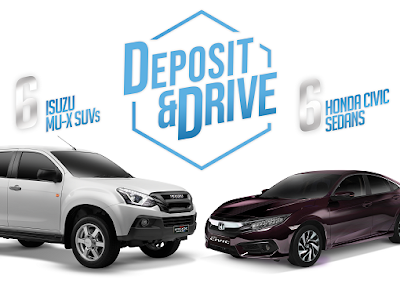 Six units each of brand new Isuzu mu-X SUVs and Honda Civic Sedans are up for grabs. The more you save with RCBC and RSB, the more chances you get of winning in the raffle draw. Turn your saving woes into the ultimate grand prize! Simply earn a raffle entry by depositing “fresh funds” into your new or existing account, and maintaining the minimum average daily balance of at least Php 50,000 for your personal account and Php 500,000 for your corporate account. The final number of raffle entries per account will depend on the cut-off period. Fresh Deposit Funds are limited to: (a) funds deposited to open an account during the Promo Period; or (b) additional deposits made to existing accounts during the Promo Period. Also, by just dropping by your branch of account and updating your account information, an additional raffle entry is given to you. With RCBC and RSB, each deposit gives you a chance to earn a spot for you to drive away with your dream wheels! Deposit and Drive is open to all new and existing account holders, from individual, joint and corporate accounts. Mark your calendars for the first draw on February 14, 2019 and April 15, 2019 for the final raffle draw date. Start believing you can drive home with a brand new car. Saving has never been this exciting with RCBC and RCBC Savings Bank’s Deposit and Drive promo.